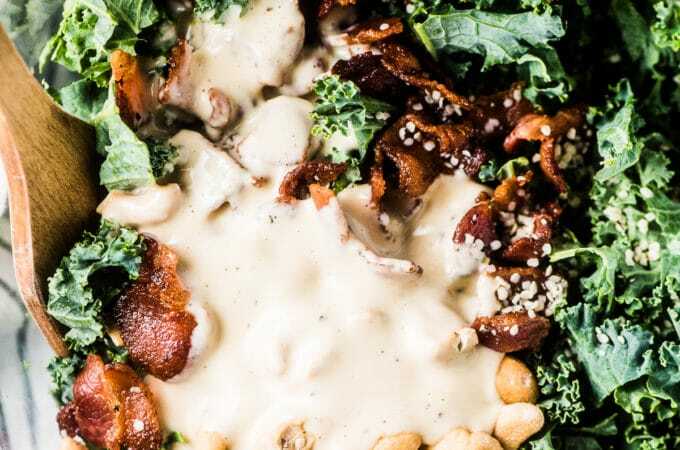 Bacon Kale Caesar Salad is the best way to eat lots of kale. This grain-free and paleo caesar includes crispy bacon and toasted cashews instead of croutons, which gives it crunch and tons of flavor. It's easy to make, healthy, and delicious! 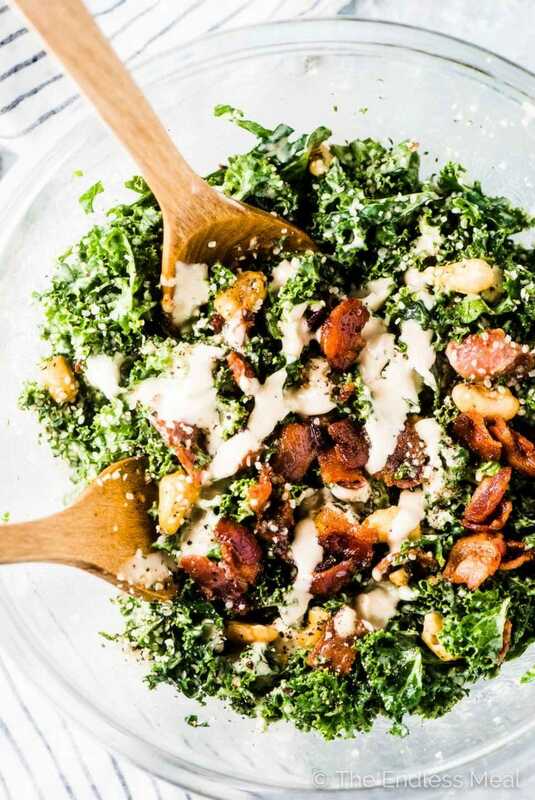 I hope you can forgive me for sharing yet another kale salad recipe. This is (and I'm not exaggerating) the 10th kale salad recipe on this blog. I know that kale is overdone and so last year, at least that's what all the super cool, super hip kids are saying these days. But how am I supposed to move on when I'm still so in love? I've always trailed a step behind the newest trends (and don't even get me started about the latest fashions) so I think it's only fitting that I keep kale in my repertoire a little longer than most. And really, if something is this good (and good for me! ), then I'm keeping it around even if it has fallen out of fashion. I hope you'll join me as this kale caesar salad is insanely delicious. It even got a “this is really good!” from my handsome man who only eats kale reluctantly. Big time win! The kale is chopped. Not only does this step make the salad easier to eat, it means more of the delicious dressing wraps itself around the kale. Toasted cashews. I know this is a bit of an oddball ingredient, but trust me that they make the salad. IMO they are WAY BETTER than dried up old croutons. And better for you, too. Easy homemade caesar dressing. I'd really encourage you to make your own mayonnaise. (And if you're squeamish about raw eggs, I've shared how to easily pasteurize them in the mayo post.) But if you're short on time, you can use store-bought mayo instead. Crispy bacon. Cause bacon makes everything better. 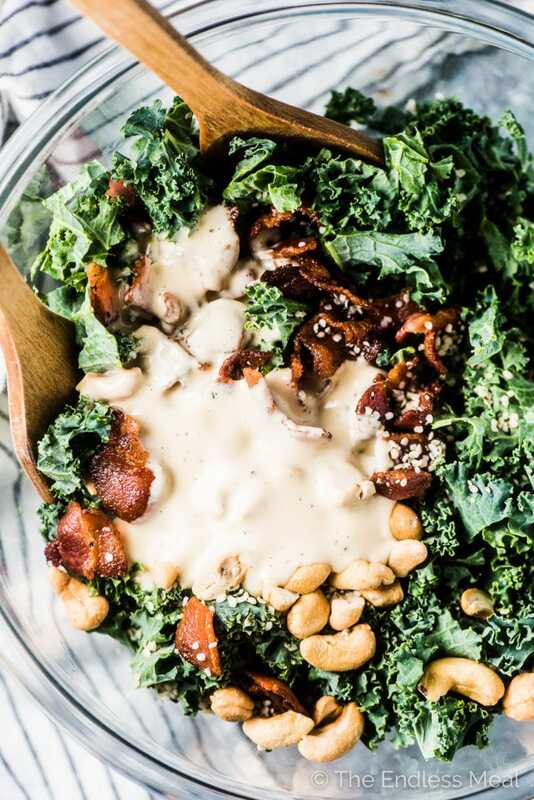 Bacon Kale Caesar Salad is the best way to eat lots of kale. 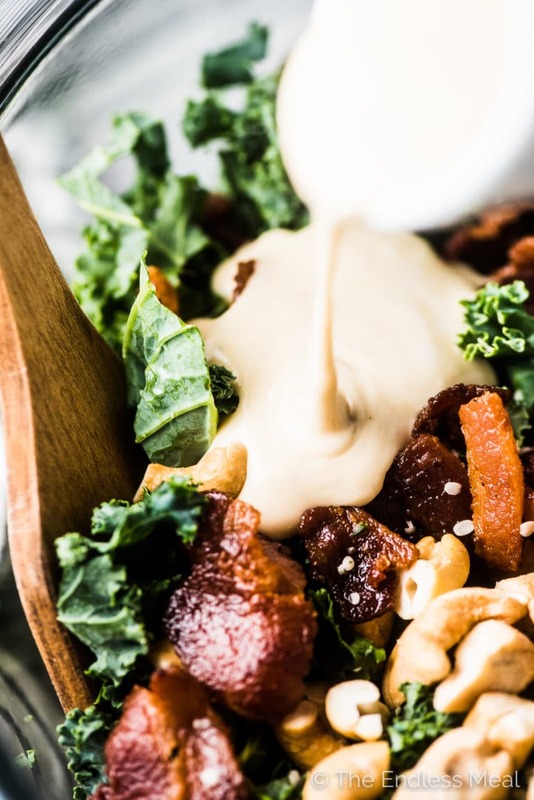 This grain-free and paleo Caesar includes crispy bacon and toasted cashews instead of crouton, which gives it crunch and tons of flavor. 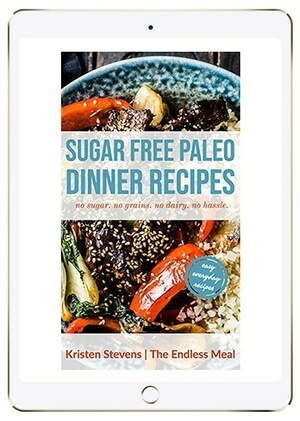 It's easy to make, healthy, and delicious! Slice the bacon into 1″ pieces and cook until crispy. Reserve the bacon oil. 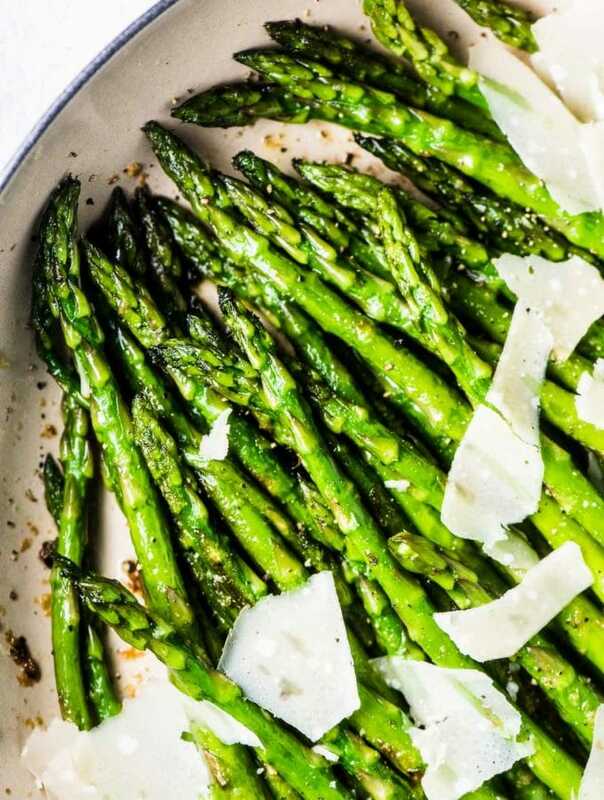 Whisk the Caesar dressing ingredients together in a medium-sized bowl. 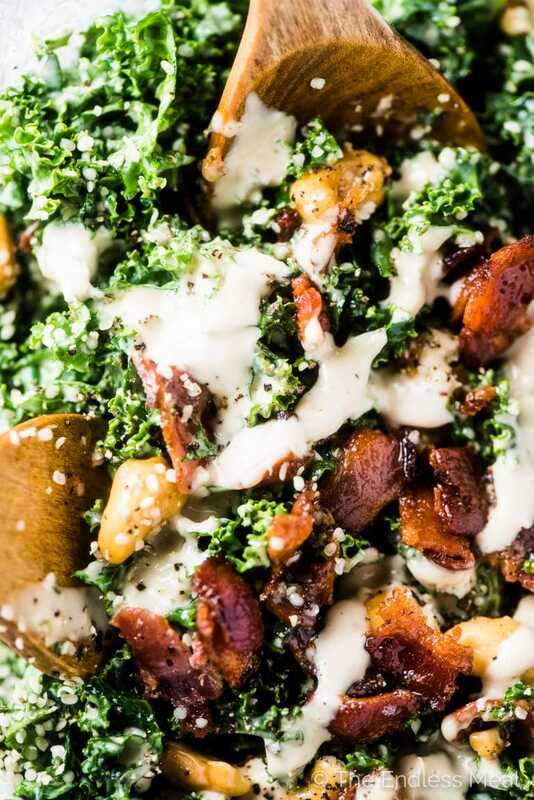 Add the kale, crispy bacon, cashews, and hemp hearts to a large salad bowl, pour the dressing over top, and toss well. Kristen, this salad looks “over-the-top” yummy. 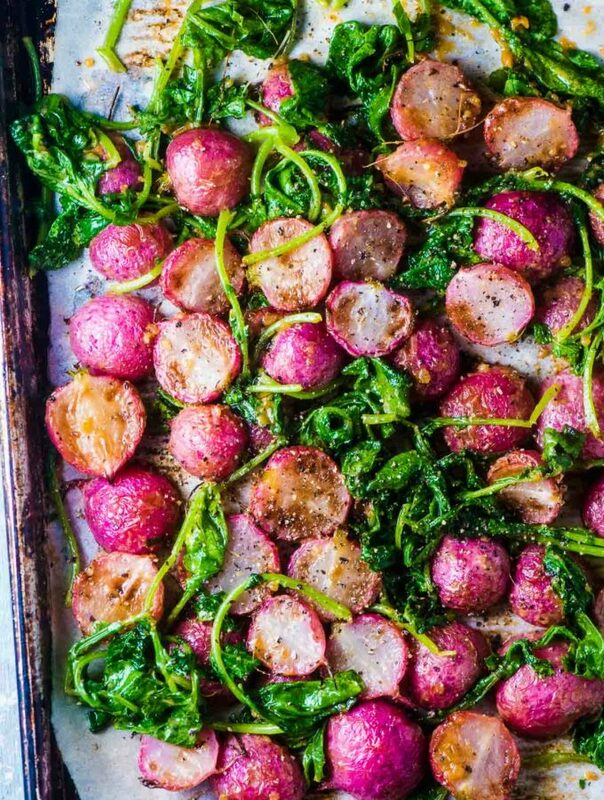 I love SIMPLE but I also love FLAVOR and this Kale Salad of yours delivers on both. I know I’ve mentioned this before, but your photos are gorgeous! They make everything you share so very appetizing. Awww thank you so much! This salad is seriously one of my favorites. I’m making again for guests tonight!